Major: I’m transferring to Augusta University to complete a Bachelor of Science program in dental hygiene. How would you describe yourself to someone who does not know you? I’m passionate, caring and creative. I enjoy learning. When I have a goal in mind, I work diligently to achieve it. I care deeply about others and especially adore animals. Although I’m quiet, I love to laugh and have fun! If you could start college all over again, what would you do differently? I wouldn’t rush into choosing a major. As a freshman, I wasn’t fully aware of what I wanted to do. As a result of changing my major, my expected graduation was delayed by a year. What is your favorite childhood memory? Driving to Pittsburgh every winter break was an extremely special time. The annual trip was a great opportunity for me to bond with my extended family. It allowed me really get to know my cousins and grandparents. Plus, I was able to play in the snow, eat great food, go to special parks, and watch Penguins hockey. On the drive back to Atlanta, my family always stopped at the same hotel where we celebrated New Year’s Eve with fireworks, my dad’s homemade chocolate pretzel, and sparkling drinks. If you’re not studying or on campus, what are you doing? I’m likely teaching cooking classes at Young Chef’s Academy, exercising, taking pictures, or hanging out with friends and family. Can you tell us your dream job? I would love to be a dental hygienist and inspire people to share healthy, confident smiles. I also wish to continue to grow my social media and become an influencer. Creating looks with special effects makeup is a hobby, and I’d love to turn this skill into a side job. Where is your favorite place that you have traveled to, and why? I’d narrow it down to Amsterdam or Canada. I love both places equally because everyone seemed super friendly. Both areas are beautiful and have great weather. Amsterdam has a lot of important Jewish history, including the Anne Frank House. As a bonus, it is easy to find foods cooked with fresh ingredients in both areas. What has been your favorite event with Chabad this year? I really enjoyed Sinai Scholars because I was able to become closer to the rabbi and his wife. 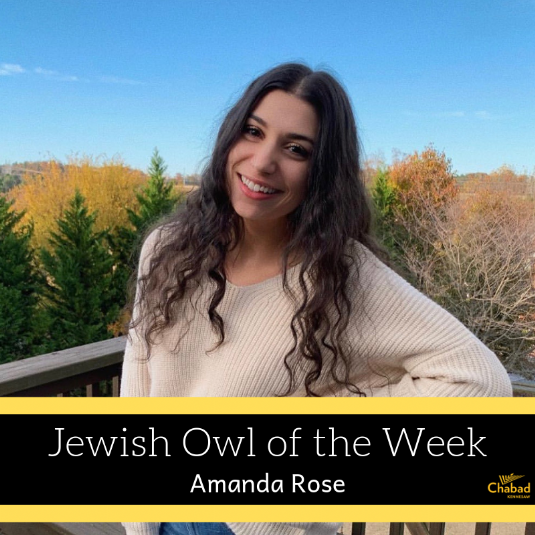 The program allowed me to form connections to other Jewish people at Kennesaw. Of course, I also learned a lot. What is one of your favorite Jewish traditions or holidays? I really enjoy Passover because friends and family come from out of town to celebrate the holiday with us! Why would you encourage Jewish students to get involved with Chabad? Initially, I was intimidated to come to Chabad events, but I’m really glad that I gave it a try. I’ve met so many nice people. The events are creative, and learning is fun. Favorite Jewish Food? Bagels and lox! Can you tell me your favorite part about KSU thus far? My favorite part of college has been being in AEPi, and meeting and growing close with all of the brothers. What do you find the most difficult aspect of being a college student? The hardest part of college has been using my time in the most effective way. You are a brother of Alpha Epsilon Pi; tell us what your fraternity means to you. I think being in Alpha Epsilon Pi has broadened my view on being Jewish, from growing up without it, to now having a group of other Jews who are similar to me. It really helped me adapt to college and become a better man. If you’re not in class, what else are you doing? Tell us some of your favorite hobbies or activities. I love to grill and smoke barbecue. Also, I enjoy watching Netflix. What was your first Chabad event? What was your first impression of the organization? My first Chabad event was the Welcome Back sushi event, and I was extremely impressed by how many different Jews were there. I was immediately brought in and treated like family. If you could change or upgrade anything about Kennesaw State University, what would that be and why? I would add more options for classes, so there will not be any challenges with getting the classes you need. What is one of your favorite Jewish traditions or holidays? My favorite Jewish holiday is Hanukkah, because I enjoy getting together with friends and family and making and eating latkes. Why would you encourage other Jewish students to get involved with Chabad? Chabad is super helpful to meet a lot of your closest friends. Who is your Jewish hero and why? I think my father is my Jewish hero, because he showed me how to grow up the right way. Favorite Jewish Food? Bagels with lox! Where are you from and how did you end up in Kennesaw? I honestly don't even know where to say that I'm from, ha-ha. I was born in Fort Lauderdale, Florida, but when I was about four I moved to Israel. I moved back to Florida, and then to Georgia when I was thirteen. When someone asks me, I usually say that I'm from Florida because that's where I grew up, but I'm Israeli as well. I actually graduated high school early. Not many people know, but I started college at 16 so I'm still a baby. It's funny because when I meet people and they realize I'm younger, they all react differently. Some laugh, some are really surprised! If you could start college all over again, what would you do differently? I would definitely go to Chabad the first chance that I could. I waited to go for some reason, and I thought I didn't really want to. But now that I'm way more involved, I can see what I've been missing out on. If I could, I would go back in time to attend every event. It would have to be going out after Shabbat dinner to the playground with my step-sister in Israel, and playing until the street lights went on. We would plan what time to go to the playground, and tell our friends so we would meet up and hang out all night. Looking back, I totally miss those days, and thinking of that memory makes my heart genuinely happy. How has going to college affected your life? I have definitely opened up more. In high school I just stuck to my group of friends and got really nervous when I had to socialize with others- it was really out of my comfort zone. Now, I'm the friend who is more likely to talk to strangers. I've become really good at putting myself out there and going to places or events where I don't necessarily know anyone. I can wholeheartedly say that I've become more outgoing and extroverted. You regularly attend Thursday night Kosher Cooking Club with Nechami. How is that experience? I started attending a couple months back, and it's one of my favorite things to do in Chabad. Basically, a bunch of girls come to help Nechami cook for Shabbat dinner. We go over the menu, which is my favorite part. My friend Jamie and I chop and braid challah together. It’s funny - challah braiding has become a fun competition between us. The experience is honestly therapeutic, because we talk about our week together. Catching up with friends is one of the highlights of cooking club. What has been your favorite event with Chabad recently and why? I really liked Family Shabbat. It gave me such a home feeling and made me feel like I was with my family enjoying Shabbat. I usually don't see my family every week because I work, so when my mom agreed to come, I was so happy. I feel like Family Shabbat made other students who can't see their family often feel the same. What is one of your favorite Jewish traditions or holidays? I have to go with Shabbat. Everything about it just lights up my mood. When I lived at home, I always helped my mom cook and set the table, which would be my favorite. The moment of having everyone together at one table with no phones or distractions is my favorite tradition. Shabbat is something I look forward to all week! Why would you encourage Jewish students to get involved with Chabad? They don't know that they're missing! I used to think that being friends with other Jewish students wasn't vital for my college experience, but that is completely not true. Going to Chabad gives you a home away from home! Truthfully, there have been many times where Rabbi or Nechami gave me advice on things I've been struggling with. Also, being around the religion and culture genuinely makes college better. You can seem to lose yourself when you're on your own, and keeping one thing constant, like practicing religion, gives me some sort of clarity. Chabad is a group of people that I can always rely on no matter what happens. We all have one thing in common that brings us together, and it is genuinely a beautiful thing. I love hummus. When I go to Israel, I eat hummus like I’ve never had it before. I feel like it’s also my favorite because I have such positive memories tied to it. Are you named after someone? If so, who? I am named after Chaim and Henoch, who are my grandmothers' fathers. My favorite thing to do is watch Georgia football. I also enjoy hanging out with my friends as often as I can. If you could go back and tell yourself one piece of advice before coming into college, what would that be? I would tell myself to work on time management skills. That is something that is not taught in high school and can be very useful in a college setting. Can you tell us an interesting fact that people would be surprised to know about you? I've been to the Masters Golf Tournament twice! I spend most of my time on campus either in my dorm room, or eating in the commons. My favorite place on campus is definitely the commons. You are a brother of AEPi here at KSU, tell us your favorite aspect of being in this fraternity? My favorite aspect is being in a fraternity where all of the brothers understand and value what it means to be Jewish. If I had joined a different fraternity, they would not understand some of the things I do since Judaism is so different from other religions. What was your first impression of the Jewish community here at Kennesaw? I was very impressed with the Jewish community here. I wasn't expecting so many people to be at Shabbat dinner. I also didn't think that I would go to Shabbat as often as I do, but it's such a great time every time I attend so I always go back. Why would you encourage other Jewish students to get involved with Chabad? 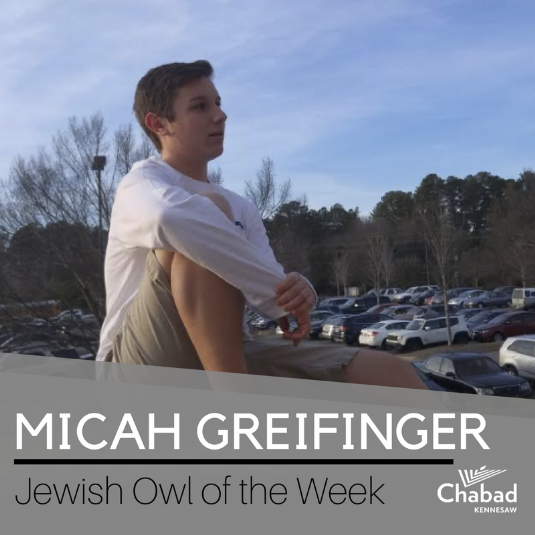 I would encourage other Jewish students to get involved with Chabad first because it’s an amazing place, but also because it’s a way to meet other Jewish students at Kennesaw and make friends that will last forever. Who is your favorite Jewish person and why? My favorite Jew is my mom. She is the reason I am Jewish in the first place, so I have to appreciate that I grew up Jewish. I'm happy that she sent me to Epstein, because I'm still very close with the friends that I made there, and I will always have her to thank for that. My favorite Jewish food is my grandmother’s chicken soup she makes when my family goes to my grandparents' house for Shabbat. It's what I look forward to every time we go there for dinner, and it brightens my day. Tell us some of your favorite things to do outside of school? I love to hang out with friends, go to the mall, or watch movies. If you could do it again, would you still come to KSU? I would still go to KSU because the campus is so pretty, and the Commons are awesome! How would you describe yourself to someone who does not know you? I am a super out-going and motivated person. Tell us about your Greek life experience. What made you want to join? Being in Greek Life has been one of the most rewarding parts of college! I love being able to bond with people and boost my leadership skills. If you could travel anywhere in the world right now, where would you go and why? I really want to travel to Greece! I have always wanted to go there, because I’d love to try authentic Greek food and explore the culture. What is one of your favorite Jewish traditions or holidays? I like to celebrate Rosh Hashanah because we get to eat apples and honey. My whole family gets together and has dinner, and it’s nice to see them. What do you want to do after college? After KSU, I want to get my doctorate in Clinical Psychology. Why would you encourage Jewish students to get involved with Chabad? I would encourage students to get involved with Chabad because the environment is so welcoming. Whether it is your first event, or you go to everything, you never feel like you don’t belong! Also, Shabbat dinners are an awesome way to meet and connect with other Jewish students! Favorite Jewish Food? Challah obviously! Since starting at KSU last semester, what has been your favorite part of college? Meeting so many new friends. What are some of your hobbies or favorite activities to do outside of class? I love playing on the club baseball team for KSU. I also like to play intramural basketball. What inspired you to be a part of Chabad Board? Tell us about your experience. I really wanted to work with Rabbi Zalman again, because he was my Bar Mitzvah teacher and I wanted to help make our events as enjoyable and special as possible. How would you describe yourself to someone who does not know you? Fun, caring, compassionate, and a great guy. Who is somebody you look up to and why? My dad. He has taught me so many life lessons: to give good advice, and to be an excellent coach and leader. What have been some of your favorite Chabad events? Simchat Torah and Sushi Night! What advice would you give to other Jewish students who want to get involved? Go and I guarantee you will not regret it. How would you describe Chabad Shabbat dinner to someone who has never attended? A great time to hang out and forget about a stressful week. It is something I always look forward to! You recently visited Israel on Birthright. Tell us your favorite part about your trip. I went on Birthright over winter break, and there were so many amazing things. If I had to pick a favorite, it would probably be getting to experience Shabbat at the Western Wall in Jerusalem. If you could give incoming freshman college advice, what would that be? Go to class and do your homework. Also it is possible to eat well and live in a dorm. You don’t need to survive on ramen. What was your first impression of Chabad here at KSU? 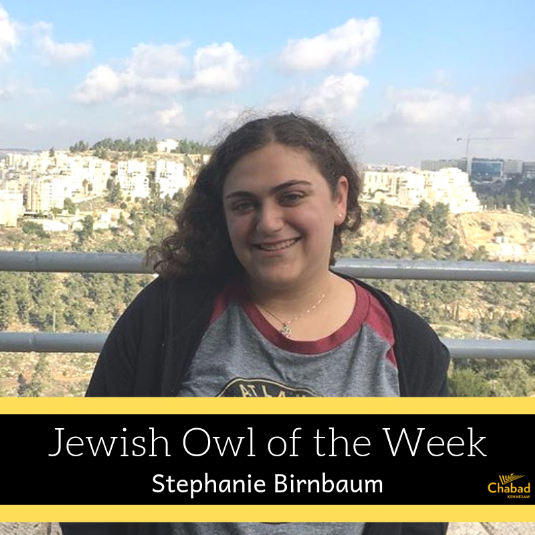 I came to Shabbat dinner one night as a freshman, and I was amazed by the community. When you aren’t in class, what are you doing? During the summer, you’ll probably find me at a Braves game. Otherwise, I’m with my friends running around Atlanta or at various concerts. What is one of your favorite Jewish traditions/holiday? Passover is my favorite holiday, easily. My family hosts Seder every year, and I love having my entire family around. You are a big part of Kosher Cooking Club at Chabad. Tell us what a Thursday night preparing for Shabbat looks like? It’s a lot of fun. I started going to Kosher cooking club my freshman year. I have not only learned how to braid challah, but made some awesome memories. Why do you think other Jewish students should get involved with Chabad? Chabad is a place where you can always find someone like you. Everyone has a different Jewish story, but having everyone come together on a Friday night is amazing. Hopefully running promo and public relations for a professional sports team! Since starting at KSU last semester, what has been your favorite part of college so far? Wow, starting off tough! I would say that my favorite part of college so far is all the new, wonderful people I have met. Coming to Kennesaw, I knew almost nobody (excluding a few from high school), but now I’ve got some really awesome people in my life who I have shared some special moments with, and hopefully many more! What are some of your favorite spots to hangout or study on campus? “Hangout” can be taken out of that question because I seriously only study. Nonetheless, I love going to Prillaman Hall or the quiet floor of the library when it comes to where I like to study. When it’s warm outside, there is this nice, semi-quiet spot in Kennesaw Hall where I go sometimes to read a book or just continue to study. Tell us about your experience as a Chabad Board member. What inspired you to join? 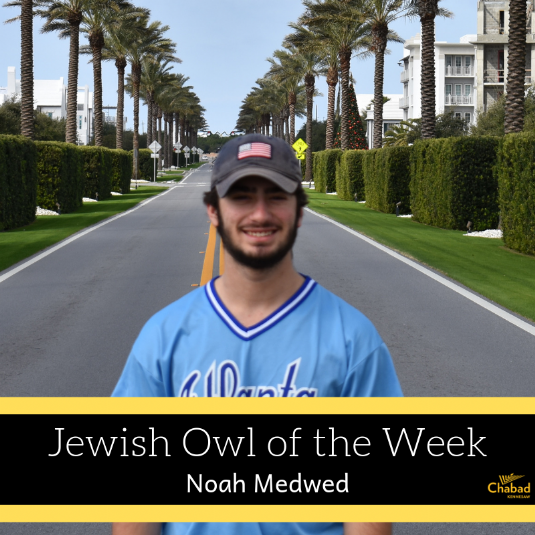 Getting involved with Chabad early and putting myself out there was one of the best decisions I have made since coming to Kennesaw, so to become even more involved as an active board member is something that I cherish dearly. When you aren’t in class, what are you doing? When I’m not in class, I’m probably studying (my friends can back that up). That being said, I’ve recently started going to the gym which is something I have made part of my routine. Almost 100% of the time you can find me in the Commons after a workout, eating my heart away. I also do a lot with the Alpha Epsilon Pi fraternity where I am a brother, as well as stay active in the Chabad organization. You have attended Shabbat almost every week since coming to KSU. What keeps you coming back? You would think that as a board member, it’s my obligation to attend Shabbat. However, I go back every week not because I’m obligated to, but because I want to. I enjoy the experience immensely every single time. From the food, to the songs, to the people I get to meet, Friday nights are a special experience I love being a part of. What advice would you give to other Jewish students who want to get involved? My advice would be to just go to one event. Just one. At Chabad, people are friendly and are always down to make a new friend. If you go to one event, I guarantee you’ll make one new friend and probably even more. Life is about going out and doing things you aren’t normally comfortable doing. That’s the only way to meet new people and more importantly, grow as a person. That’s what happened for me, so I don’t see why it can’t happen for you. What is one of your favorite Jewish traditions/holidays? I’m going to go with Shabbat. Although it is a holiday that occurs every week, it never loses its significance. As long as I’m around, you know I’ll be at Shabbat dinner. Favorite Jewish Food? Okay, this is easily the hardest question. I haven’t had it in a while, but my dad makes some killer Shakshuka, so I’d definitely have to say that. That’s not to say that Shawarma isn’t good either. Also, Pita Grille in Sandy Springs makes a pretty darn good Laffa. What do you consider to be your spirit animal and why? Dory from “Finding Nemo” is my spirit animal. “Just keep swimming” is basically how I’ve started living my life. The places you go and the people you meet are part of your life for a reason. The more you keep swimming, the more people you will meet and the more places you will go! What is your favorite part of KSU? Getting to experience being on a college campus! I lived at home my first two years of college, and a part of me felt like I was missing out on the real college experience. I am so thankful that KSU has been able to give me that! 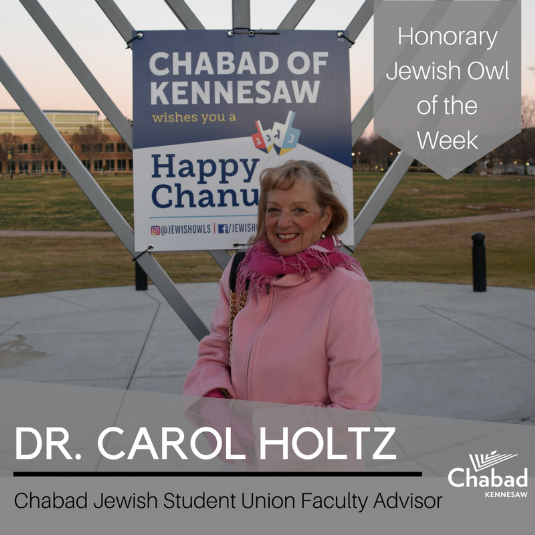 You have been involved with Chabad since you started here at KSU. Tell us how this organization has impacted your college career? When I moved to Kennesaw, I didn’t have a single friend. It was something I was really nervous about. I moved to a new place and started a new school without knowing anyone. On the very first day of classes, Chabad was hosting a welcome back sushi lunch on campus. As soon as I walked into that room I felt so welcomed, and I felt like I had found my place. Now I am at Chabad multiple times a week and I have met so many friends through this amazing organization! You are a big traveler; tell us about some of the destinations that you have visited. I have visited Israel, Greece, and many islands in the Caribbean. I also had layovers in France and Italy…can we count those?! What is one of your favorite Jewish traditions/holiday? I would say Shabbat on Friday night is my favorite Jewish tradition! All week I look forward to spending time with my friends at Chabad. Shabbat to me is about friends, good food, and looking forward to a day of rest! If you could visit anywhere in the world right now, where would that be and why? Right now, I would choose Japan! All of my friends know that sushi is my favorite food, and it is on my bucket list to eat authentic sushi made in Japan. Tell us about your experience on Thursday nights at Kosher Cooking Club. What motivates you to come each week? I started helping Nechami cook for Shabbat back in August. I have always loved cooking and I actually find it very soothing. Cooking is an art for me and it’s always exciting to see what can be created next. I love spending time with Nechami and helping her plan meals, and just getting to hang out with her in the kitchen. I am finally mastering the art of challah braiding! Favorite Jewish Food? Definitely homemade potato latkes! Can you tell us an interesting fact about you that people would be surprised to know? I am a very outgoing person who likes to be loud and active. What do you find the most difficult aspect of being a college student compared to a high-school student? What I find most difficult is the difference in class sizes. At KSU, I have some classes with over 50 people. What do you like most about KSU? I obviously love the commons, because I love food. I also like that it isn’t a huge school, but also not a tiny school. For example, it doesn’t take long for me to walk from my dorm to my class or one class to another. Also, the professors and people I have met have been amazing. If you’re not in classes, what are you doing? Tell us some of your favorite hobbies/activities. I am usually in my room doing work or playing PS4. I also go play basketball, go eat at the commons or the student center with my friends. If you could pick any place in the world to travel to, where would that be and why? If I had to pick any place to travel to it would be South Africa, because my dad is from there. He lived there for 11 years, and it would be cool to see where he grew up. 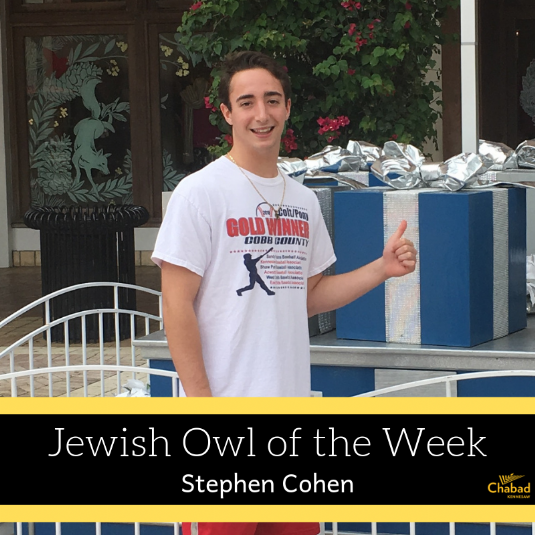 You are a brother of AEPi, so what has been your favorite aspect of being in a Jewish fraternity? My favorite aspect is that I have people that support me. I can trust them and they can trust me. Another thing I love is that I’m with people that I have something in common with: being Jewish. I also can now say I have “brothers”, because I only have an older sister as a sibling. You are involved with Chabad on campus. What was your first impression of the organization? To be honest, I was worried. I never went to Chabad in Atlanta. When I walked in and met Rabbi, I was pleasantly surprised. The environment was nothing like I expected! It was so chill. I also wasn’t expecting a big Jewish population at KSU, but I was wrong. Seeing so many Jews in one house made me more comfortable. In fact, I usually go every Friday night to Shabbat dinner. Also, this semester I am doing a program called Sinai Scholars, which has been so much fun. If you could change or upgrade anything about KSU, what would it be and why? If I had to change or upgrade one thing at Kennesaw, it would be more restaurants on campus. I know there are a lot of restaurants around campus, but it would be easier if they were on campus so students don’t have to waste gas. Why would you encourage other Jewish students to get involved with Chabad? If you're Jewish and don’t come to Chabad events, you shouldn’t be shy and just come to them! They are so much fun and you meet so many great people. Rabbi is one of the nicest, coolest guys I have ever met. It is a great time to be with people that are like you. I love going to Chabad events. What is your favorite Jewish food? My favorite Jewish food would probably be Matzah ball soup or Kugel. Most people would say falafel, but I can’t stand falafel. Can you tell us your favorite part of college thus far? Meeting a bunch of new people and learning about myself. I have enjoyed exploring different options for my future while still being able to follow my passions, for example color guard. What do you find the most difficult aspect of being a college student versus a high school student? There is more responsibility and independence when it comes to college, so I have to make sure that I continue to stay on task with my schoolwork. You are very passionate about fashion; tell us who your fashion icon is? I have two fashion icons who I look up to everyday: Kate Spade and Betsey Johnson. They are both unique fashion designers who are not scared to create something out of their comfort zone. They both add so much creativity and inspiration to the fashion world. You are a very active member of Chabad on campus and on the board; can you tell us what inspired you to get involved with Chabad? I have always loved being able to be a part of an organization where I can share my ideas and help the organization grow. Being a freshman at Kennesaw, I didn’t know many people. Through Chabad, I was able to meet a bunch of people who are now like family to me. I consider Chabad my home away from home. The environment is so warm and inviting that you can’t help but smile. How would you describe the atmosphere at a Chabad event? The environment is warm, lively, inviting, and exciting. Why would you encourage Jewish students on campus to come out to Chabad events? I encourage students to come to Chabad events because they will never leave hungry and they will leave the event having met a new group of people that they can call family. Rosh Hashanah, because I get to be with my family and start a new year. One of my favorite traditions during this holiday is going with my family and our rabbi to a local nursing home where we sing songs together. The rabbi blows the shofar and says a prayer for the people who were unable to attend the services. Tell us about your marching band experience at KSU. 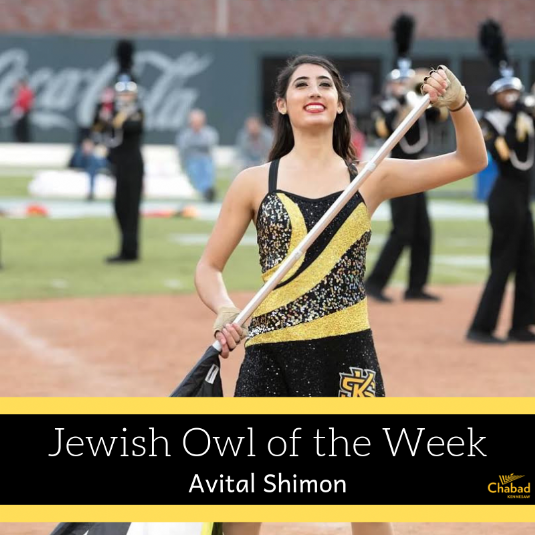 I have loved being a part of the KSU Marching Owls. Color guard was an activity I did throughout high school, so I was very happy that KSU had a color guard as well. It made the moving-in process easier because it's something I am very familiar with. I attended all the home games to cheer on and support the football team, and performed half-time shows. One of my favorite days was the SunTrust Park game, because the team went into five overtimes and the crowd was going wild. It was amazing to see so much school spirit. Performing is something I love to do because it allows me to express myself and be someone others can look up to. Brisket with tahini and couscous! You are the current President; what made you want to take on this role? 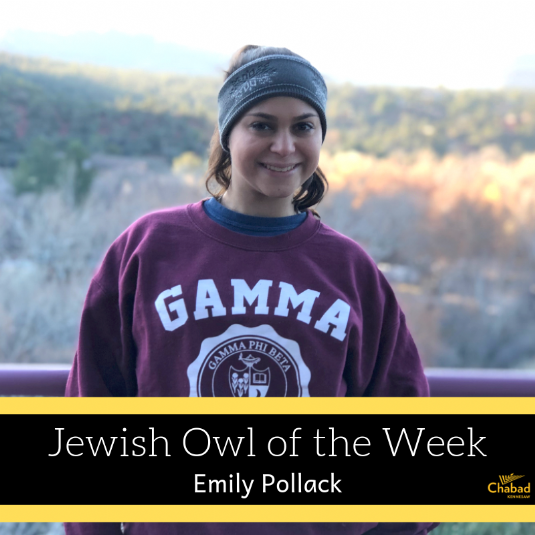 After being on the board the past few semesters, I saw firsthand the positive impact Chabad has on Jewish students here and I want to contribute! What do you want to see happen during your Presidency for Chabad? The main goal is to make sure every Jewish student has a place where they always feel welcome and like they are part of a family. 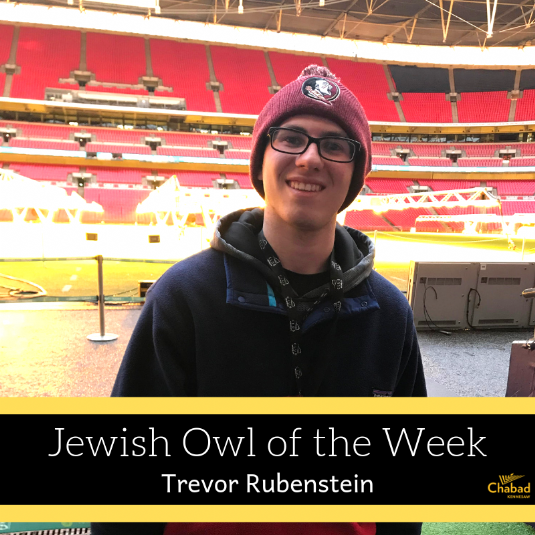 I hope to see more and more Jewish students getting involved and having happy, memorable experiences. What are some of the programs you are implementing at Chabad? And why are you doing this? We introduced Café Chabad this semester, a weekly open house where we serve lunch and welcome students to hang out, study, and take a break from their busy days. I want Jewish students to have a community right on campus and Café Chabad has been successful in that! Also, we are having our second Shabbat 100 on April 20th this year and we hope to have a great turnout. Some other programs we’ve had this semester: JewQ Trivia Night, Ladies Nights, and a leadership workshop! What it is like to work alongside Rabbi and Nechami? Rabbi and Nechami are extremely dedicated to creating a warm environment for Jewish students here and I admire and appreciate them so much! It’s an honor to work with them. How would you describe Chabad to someone who has never participated in any events? Chabad is fun, friendly, and a great place to meet other Jewish students. I know the people I’ve met at Chabad are going to be lifelong friends. Where do you prefer to study and how do you balance classes? I mostly study at Starbucks or the library. Time management can be challenging, but since I like what I’m studying, it makes class enjoyable. After attending the NYC Shabbaton twice, highlight some of your favorite moments. Both the 2016 and 2017 Shabbatons were eye-opening experiences. I learned a lot about Judaism, and the positive energy I felt was amazing. A highlight was simply being in Crown Heights surrounded by so many friendly people. What are your future goals? Where do see yourself after Kennesaw? I hope to pursue a career in broadcast journalism and hopefully work for a major news network. It all depends where life takes me! Why don’t you start by telling us your background education? How long have you been teaching, and what made you want to go into this career path? Well, I’m from Cincinnati, Ohio. I graduated with a Bachelor of Science in Nursing. I ended up following my husband to Atlanta who was doing a Residency at Emory. We had a child born in Cincinnati, and then another in Atlanta. Eventually, my husband was drafted into the Navy and I moved to Texas with my husband and children where I taught nursing. However, we ended up back in Atlanta, where I had our third child. I went back to school at Georgia State to get my Masters in nursing, and then I taught at KSU for a while. However, I ended up back at Georgia State to get my PHD. I’ve now been teaching for 36 years, and will retire in July. I’ve taught in mostly the undergraduate, but I have worked in other areas as well. Additionally, I’ve taken students to different hospitals and clinics to get experience for their clinicals. My favorite place to take the students is Grady. What accomplishment over the course of your career are you most proud of? A lot of different things. Right now, I’m the chair of Public Health for Cobb and Douglas Counties. It’s a big responsibility. I’m also the Associate Journal Editor of the International Journal of Transcultural Nursing. Additionally, I have a contract to write a 4th edition to my textbook. Another thing I am proud of, is the study abroad program I have been doing for 23 years. I take nursing students for 2 weeks to Oaxaca, Mexico. These trips helped me to master Spanish. I am almost fluent. What are some of the things that you have seen change at KSU? The student body and campus has grown. As of now, we have undergraduate and graduate programs. I’m also happy to say that we now have a huge Jewish presence. Tell us about your family and background. We joined the Etz Chaim Congregation in 1980. In fact, my granddaughter is about to have her Bat Mitzvah there. To discuss my family, I have three children who are all married, and 13 grandchildren. I do family dinner every few weeks to get everybody together. Also, about me, I love to travel, with KSU or with my husband. I am actually going to Cuba with KSU very soon. Tell us something that a lot of people would be shocked to know about you? A fun fact about myself, is the fact that I took a few courses at KSU, and didn’t tell anyone I was a professor. One of the courses was Medical Spanish. So many Jewish students admire you and respect you for keeping the Jewish spark alive, even before Chabad existed on this campus. 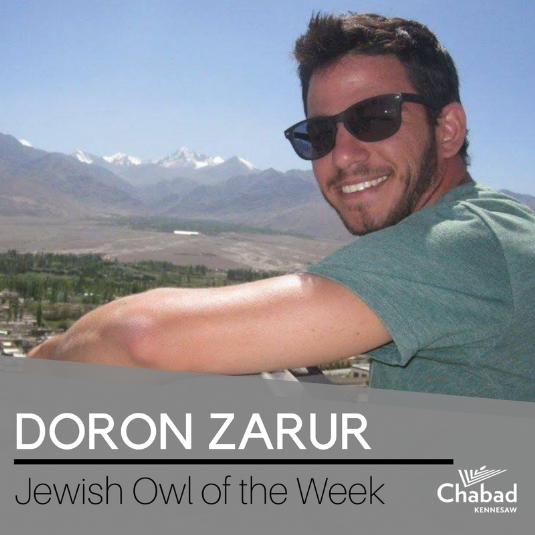 As the Chabad faculty advisor, tell us why you are so passionate about this organization? I worked with The Dean of the Business School who was Jewish, and we invited Jewish students to meet with us. I think any Jewish presence on this campus is important, and I will support it in every way that I can.  You have been incredibly supportive of the work of Chabad on Campus and Rabbi Zalman & Nechami, can you share with us how that came about to be and what prompted you to make it your mission to see Chabad succeed here at Kennesaw State? I had a friend who got me in touch with Rabbi and Nechami. In fact, Rabbi randomly came and knocked on my door in West Cobb, and I was thrilled to see him and discuss KSU’s Jewish life. I remember he only had three children then, when I went to his home for a Sukkot dinner. I think Rabbi and his family are so delightful. He has the greatest wife and the most well-behaved kids. You have been to many Chabad dinners and events; how would you describe the feel of this organization? It’s like being with a family. I don’t feel like an outsider, I feel at home and very connected here. At Chabad, I don’t have to worry about what I say, or what I eat. I also like bringing my husband to Chabad, as he is emotionally connected to Judaism. Rabbi and his wife are just a special family. They show by example, and reach out to students which is truly wonderful. What are your hopes for the Jewish students here on campus? I hope they spread the word, and I hope more Jewish people get involved. I think having a sukkot, or a table on campus makes Jewish students want to be connected. 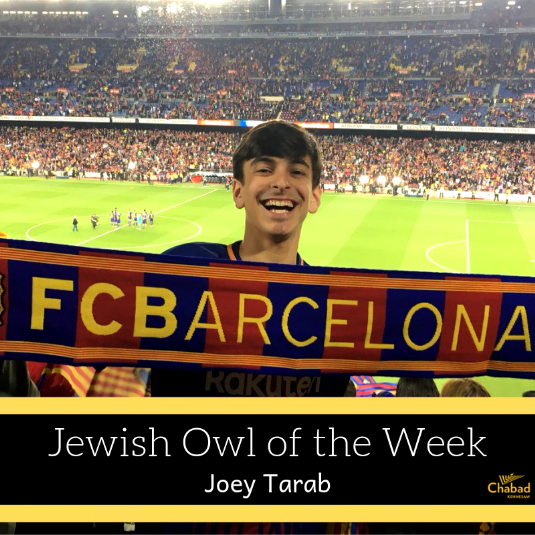 The connection is there, and part of our job is to educate the faculty and students about Judaism. Let’s be the example. Where do you see Chabad in five years from now? I want to see the Chabad house on campus, and even more students belonging to this organization. I want the students to be proud of their identity. I want this generation of students to continue in Judaism, and have a background in Jewish knowledge. I want students to feel how I felt as a little girl, where I was surrounded by Judaism. Can you share a message for the parents of students involved with Chabad? I think they should be proud of their children for connecting and getting involved in Chabad. Parents should get their Jewish students connected with this organization. It’s where they meet their best friends and possible spouses. What are your thoughts about the recent property purchase and future Chabad building? I think it’s very exciting. It’s the progress that KSU is aiming for. The culture of Judaism will be on campus, and that is what we need. Jewish people will now continue to expand in Cobb county. The Jewish growth reflects on this campus. I feel that the new generation has changed the Jewish presence. Why do you feel it is important that the general Jewish community and parents get behind this project with solid financial support? Well, it’s going to take a lot more people to make this actually happen. Unfortunately, the students can’t support it. This Jewish home needs to be on campus. It’s time. Any message for your fellow Jewish faculty members? I think they need to make their identity known and not be avoiding. They should make the connection on campus. For example, I want my students to know I’m Jewish so they can reach out to me if they want. What is your advice for aspiring teachers? I think they are going to need to connect to Chabad and other organizations and become leaders. They will have to give time out of their personal life to become part of the community. After years of teaching, what do you think are the traits of a successful college student? Well they have to be physically and mentally stable and enthusiastic about their studies. It’s a competitive world, and they must study. They also must take care of themselves. Your final contribution to KSU, is being on the search committee for the new President of KSU? Can you tell us about that? What are you looking for? Someone who is open minded and academically sound. We want someone who embraces a variety of cultures, races, and religions. Our future President needs to be open about expanding, not just in numbers but in quality. This president will need to extend themselves and push what we need. Leaving such a career is probably going to be a big adjustment, what are your plans after your retirement? I’ll start with, that it is entirely my choice to retire. In fact, they are asking me to stay. But it’s time, because of my age. I want to stop now, while I’m well, so I can enjoy my life. There are other things I want to do, and I’m not going to live forever. As of now, I do not have much flexibility because I teach all year round. I am looking forward to visiting family who are scattered around the country, instead of just a phone call. I also have 3 academic things I’m going to take with me, as I mentioned previously, so I’ll still be busy. It’s crazy to think that when I started at KSU, I had babysitters for my kids in the evening, but now I have fully grown, married children. What are your final statements about Chabad and the importance Jewish life on this campus? 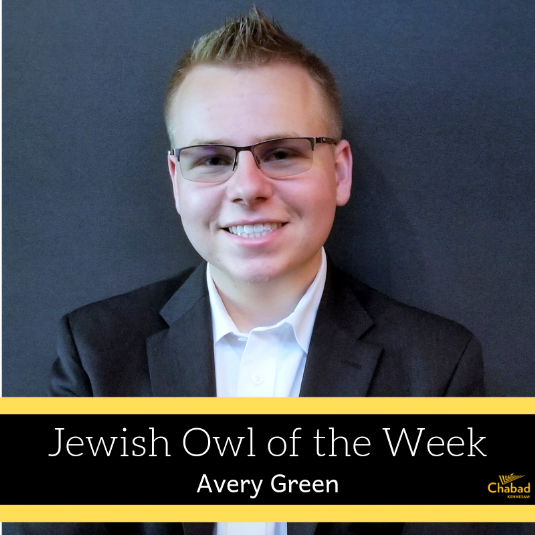 It’s essential, and I think that the student body that is Jewish need to connect. Jewish faculty and students need to support each other. Lastly, what is your favorite Jewish food? What I’m eating right now, pastrami with brown mustard on rye bread! Matzo ball soup is another favorite. 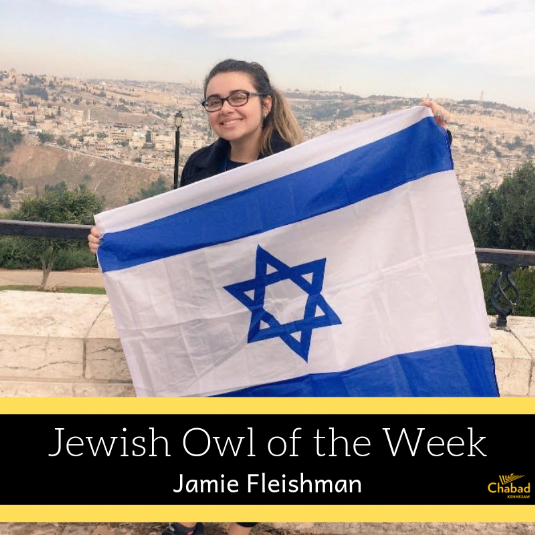 Unlike most of our Jewish owls, you are Israeli! Can you tell us about your life back home in Israel? Studying Architecture major doesn’t leave you with a lot of free time. But when I had free time, I was hanging out with family and friends, swimming, and working. But mostly I loved to surf in the Mediterranean sea. What made you move to America and study at KSU? I love travelling and this is one of my stops as I attempt to travel the world. While I am here I am finishing my degree in architecture. What is one of your favorite aspects of living here so far? The independence I have and being able to live by myself. Tell us what you miss the most about Israel? I miss my family and being at the beach. 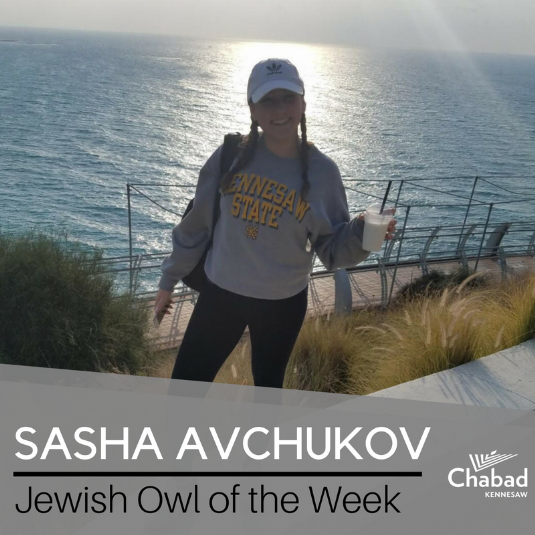 How has Chabad at KSU changed your college experience? Rabbi Zalman and Nechami welcomed me and made me feel right at home. 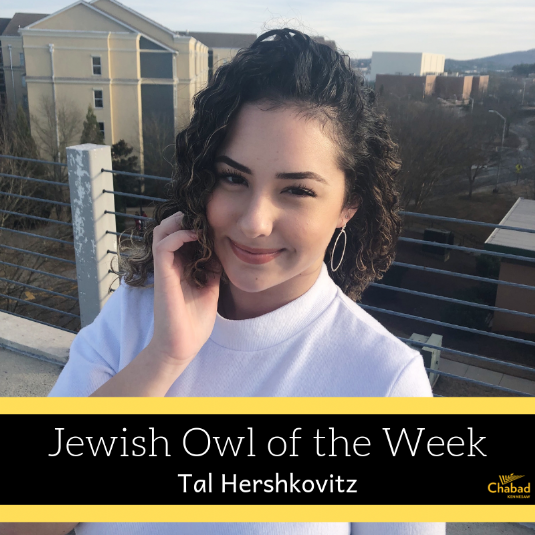 KSU is a big place and it can be a bit overwhelming, through Chabad I met a group of interesting people, and I reconnected with my Jewish roots. Where is your favorite place that you have traveled to and why? India! I travelled there between semesters during my second year at college in Israel. I was there for two months. When I arrived in New Delhi, my phone died and I had two choices: 1) Buy a new phone. 2) Continue without a phone, that means no pictures, no music, no clock, no connection with friends in the trip or with family. I took the 2nd choice and it was the best 2 months of my life! Do you plan to stay here after you graduate? Yes, but I will want my kids to join the IDF in Israel. What keeps you coming back to Shabbat dinner at Chabad every week? The good vibes from the people, the deep questions from the Rabbi, and the great food. Can you tell me your favorite part about KSU thus far? I love the people, the diversity, and the rigors that KSU has to offer. You are a brother of Alpha Epsilon Pi; tell us what your fraternity means to you. To me it means I always have a great group of faithful and supportive brothers at my side. How would you describe yourself to someone who does not know you? I am easy going, studious, and funny. If you could travel anywhere in the world right now, where would that be? And why? Hawaii, I have never been to Hawaii and I want to experience the beaches. What was your first Chabad event? Can you share your first impression of the organization? The welcome back BBQ. It was amazing to see such a wonderful Jewish group of people in the same place. If you could change or upgrade anything about Kennesaw State University, what would that be? Why? The cellular service, I can never get any service on campus. What is one of your favorite Jewish traditions/holiday? My favorite holiday is Hanukah, I love seeing all my family together enjoying a festive meal. Why would you encourage other Jewish students to get involved with Chabad? You have the opportunity to meet so many wonderful people through Chabad. The real question is, why not? Who is your Jewish Hero? Why? My grandmother, she is an inspiring and amazing woman.